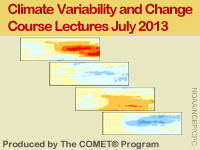 This lesson presents 13 recorded presentations from the 29 July–2 August, 2013 offering of the Climate Variability and Change Virtual Course (CVCVC). This five-day live facilitated online course provided an extensive background on a range of climate variability and change topics with an emphasis on developing communication skills for challenging climate topics. The topics covered in this course, while aimed primarily at NOAA operational climate services delivery staff will also be helpful for others who already possess a basic level of understanding of climate science. Please Note: There are no quizzes available on MetEd for these materials. However, NOAA/NWS users may complete a quiz for each lecture and receive credit in the Commerce Learning Center. The quizzes may be found in the Commerce Learning Center by searching for "Climate Variability and Change Lecture". A curriculum containing quizzes for all 13 lectures is available in the learning center as well. The physical and feedback mechanisms involved in global climate change as well as global climate change impacts on quality of human life, biological habitats, and natural resource availability.